If you always secretly wished Christmas meant giant chocolate zorb balls and ice skating in July, you’re in luck – those very things are part of the Cool Yule festival at Darling Harbour in Sydney. For a month from June 13 to July 13, Darling Harbour will transform into a winter wonderland – though maybe not like any winter wonderland you’ve seen before. This is a Yule with built-in action. A giant Lindt zorb ball will keep you enthralled in Cockle Bay. (It’s not actually made of chocolate, obviously, but it is free to ride in if you spend $15 at the Lindt Cafe, and there is your excuse to eat chocolate). And even on a bright Sydney winter’s day, it is easy to pretend you are snow-sledding on the free inflatable Thredbo snow slide 80 feet long. There are chainsaw ice sculptures, and a free Extreme Ice show on Wednesday-Friday nights (7pm and 8:30pm). Little kids will love the free Frozen Forest playground, and the Maritime Museum Snow Pit. A giant snowflake illuminates the evenings, and on some nights there will even be fireworks. If you’re starting to feel like this is not Christmas as you have ever known it, the ice skating rink should make you feel like you are back in a Christmas card. It runs from June 13 to July 13 and skate hire is $14 for kids, $24 for adults, reported TimeOut. The ice rink will also see ice hockey shoot-outs and ice-skating shows. 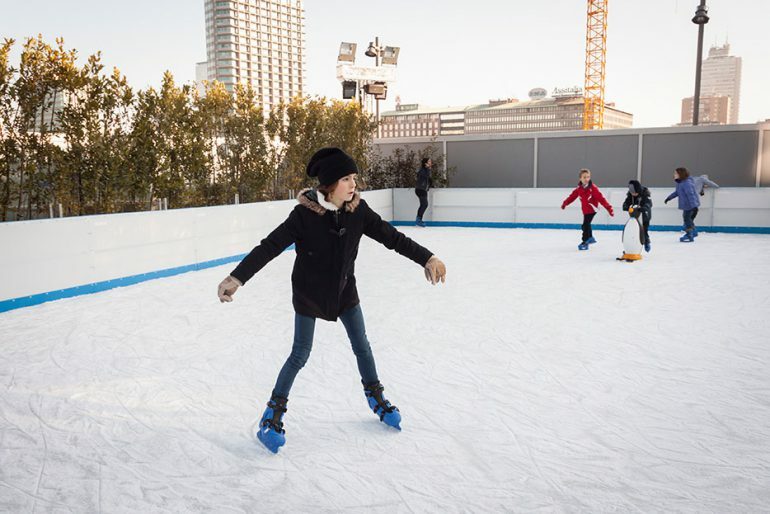 Not only can you ice-skate under the Aussie winter sun, you can feast on traditional warming winter fare from huts at the Winter Village, and warm up with apres-skate bar experiences. Austrian-born festival founder, Christoph Doerfel, said he wanted to bring all he loved about a northern hemisphere white winter Down Under. And just so you know you are still in Australia, there will be a Tim Tam Slam in the Google City Experts igloo (June 18-22), where you can chill as you submit City Expert reviews on Sydney’s bars, restaurants and cafes.